Danish Refugee Council invites Financial Service Providers to submit the Request for Proposal for the production and delivery of cash/gift cards as per the instructions given in the RFP Invitation Letter and related tender dossier that can be obtained at Danish Refugee Council Serbia premises, Sindjeliceva 18, 11 111 Belgrade, Serbia, every work day from 09:00 to 17:00, or by e-mail procurement@drc.org.rs upon a written request submitted to the same email address. Danish Refugee Council invites qualified tenderers to submit sealed tenders for the provision of rent a car services (maximum 15 vehicles for 14 months period). 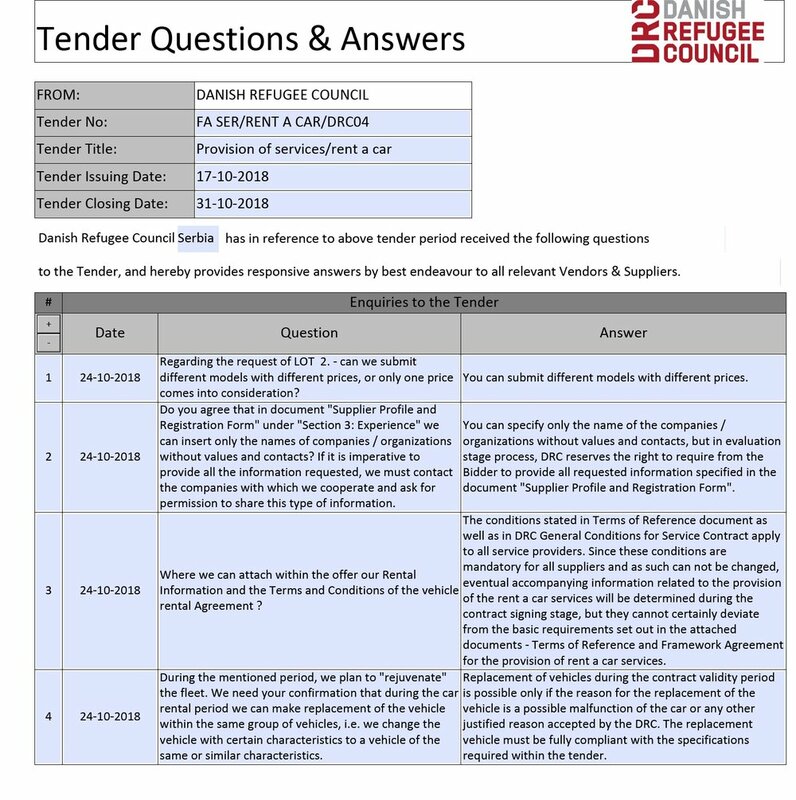 Bidders can obtain a complete set of solicitation documents in the Danish Refugee Council Office, Sindjeliceva 18, 11 111 Belgrade, Serbia, every work day from 09:00 to 15:00, or by e-mail procurement@drc.org.rs upon a written request on company memo. Danish Refugee Council invites Financial Service Providers to submit the expression of interest for the production and delivery of gift/cash cards as per the instructions given in Invitation for Expression of Interest that can be obtained at Danish Refugee Council Serbia premises, Sindjeliceva 18, 11 111 Belgrade, Serbia, every work day from 09:00 to 17:00, or by e-mail procurement@drc.org.rs upon a written request submitted to the same email address. Date of Call for EOI: 27.09.2018.